If you read Part 1, you know these posts are long and not very funny. 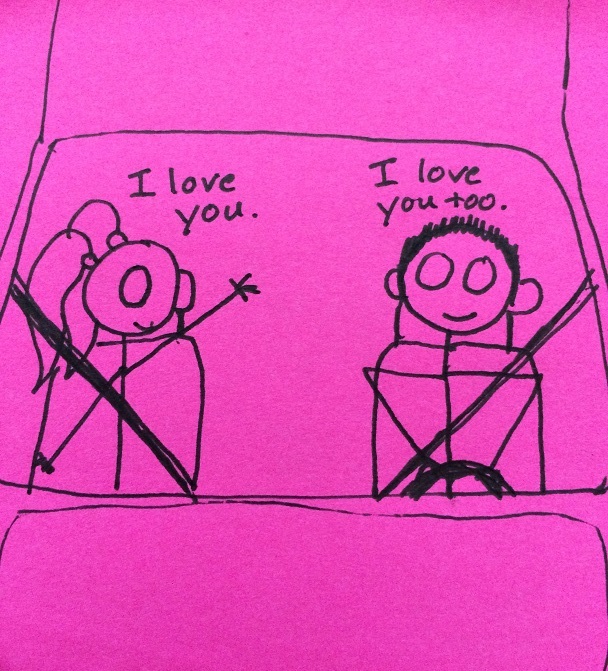 These are my version of a story I feel compelled to tell. I’m telling it in little pieces, because that’s how it happened, and it’s too much to say on a post or two. If you need a smile today, I recommend checking out this, or this instead. *Maybe you haven’t noticed, but I’m not exactly the picture of grace. 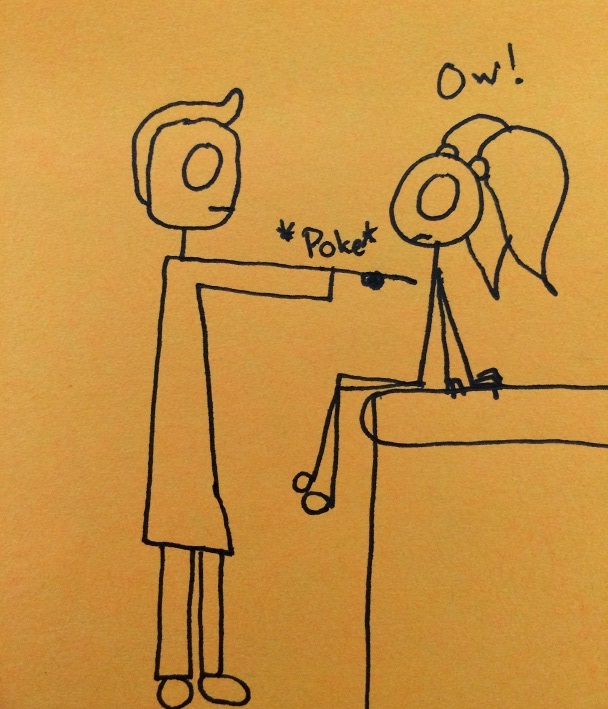 My doctor sat down with me in the exam room, something a doctor had never done before. She still had that same strange expression on her face – a frozen expression, the corners of her mouth slightly upturned in an almost-smile, with her eyes very, very focused on me – which I’m sure was meant to be comforting, but was really just jarring. She touched my hand while she spoke to me, something else a doctor had never done. Some statements just stand out more than others. 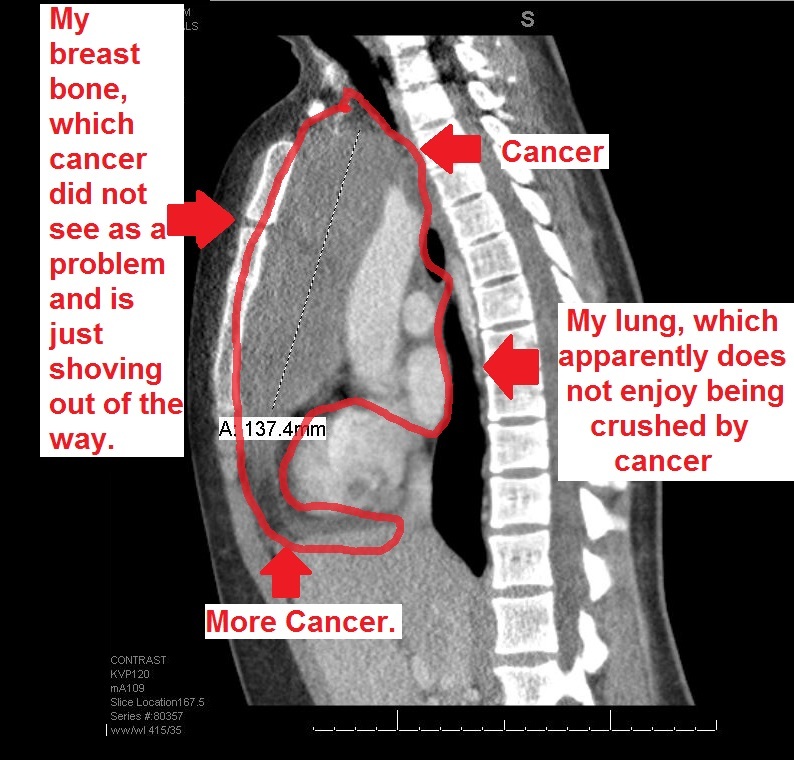 She’d taken a look at my scans, and since she wasn’t sure what she was looking at, she needed me to go see a thoracic surgeon. 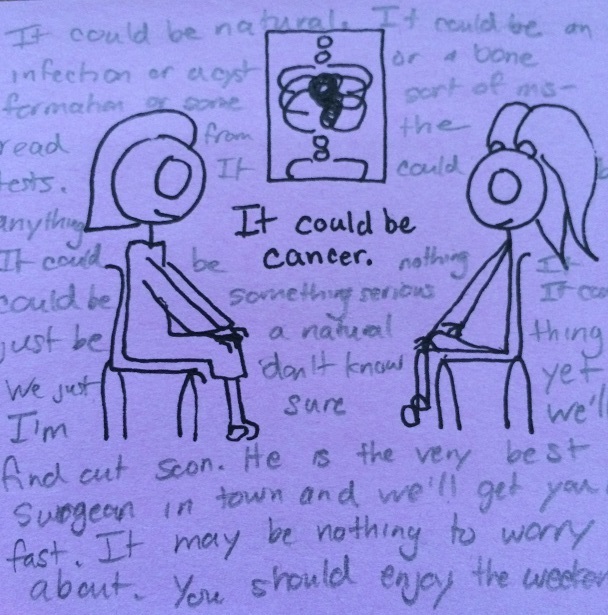 She didn’t want to say it could be cancer…but she had to be honest with me. It could be cancer. She’d scheduled the appointment for the coming Tuesday, and told me I’d need to pick up my imaging work Monday evening from the lab so I could take it with me. I was thrown off by these rapid appointments. Same day CT scans and surgeon consultations within a week? 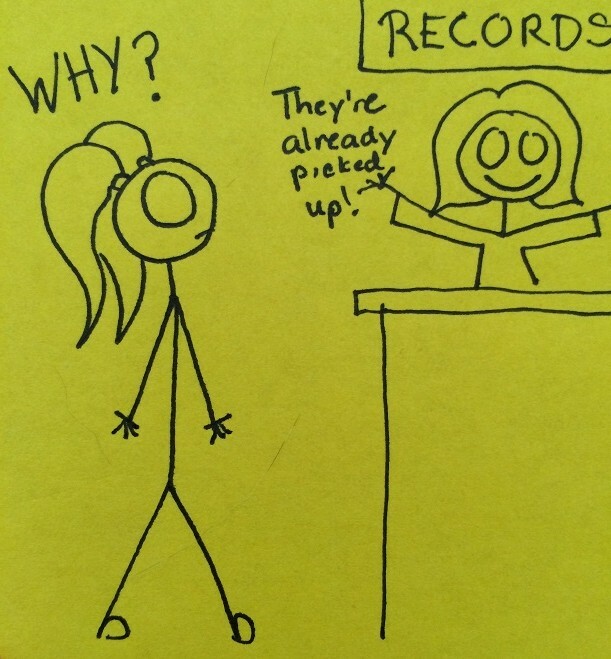 Everyone knows you have to wait forever to see specialists. I knew that from a recent catastrophic series of appointment attempts I’d had with a cardiologist. I confess. I was in a little bit of a daze when I left the doctor’s office and went to my parents’ house for dinner. A remarkable amount of my daze-related thoughts have to do with words. Grammar is cool, guys. My dad asked me what was wrong. 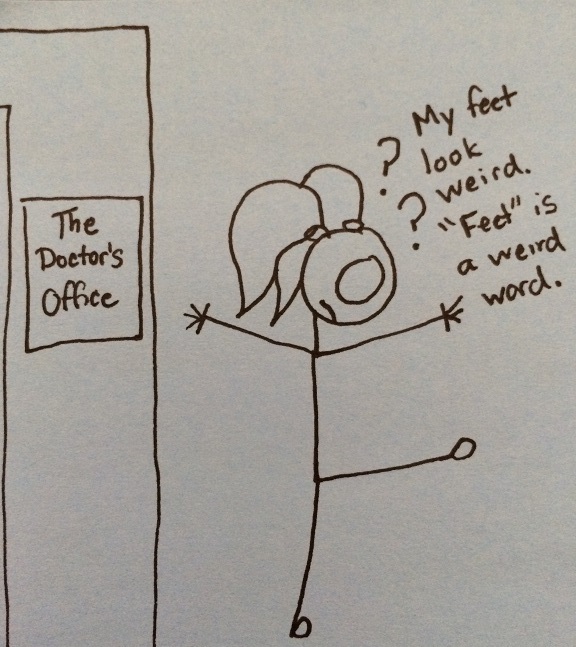 Because usually I am not so preoccupied with my feet. I know that’s hard to believe. 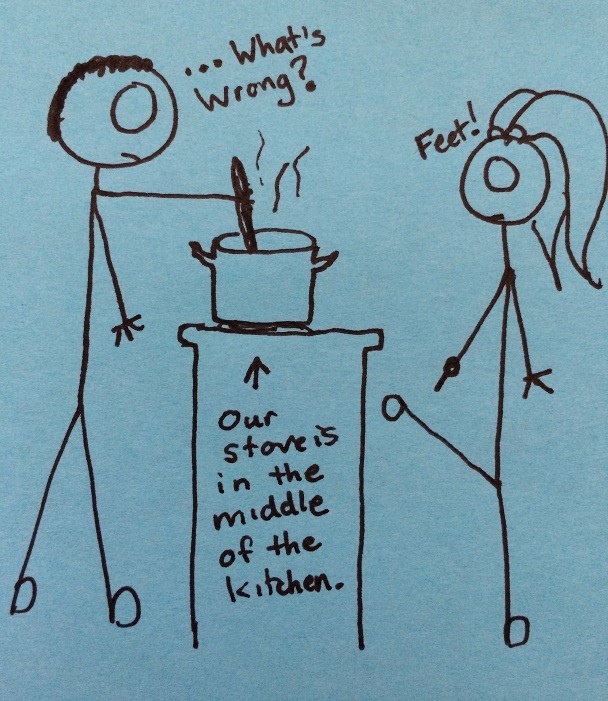 I’m pretty sure he was making spaghetti. 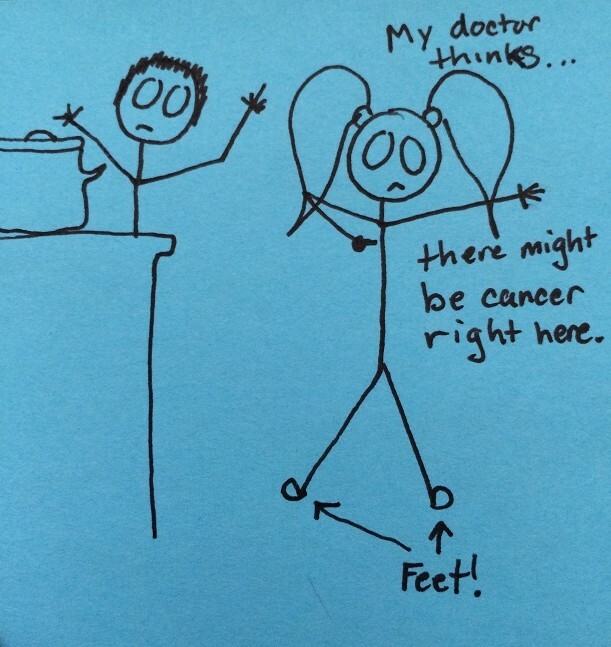 I told him the doctor said I might have cancer. He looked at me for a minute, shook his head and laughed. ** We have a history of all kinds of medical problems in our family – everything from high blood pressure to strokes – but the one thing we’ve always been off the hook for was cancer. He reassured me that I definitely did not have cancer, and it must be something else, and I was going to be fine. **Some of you are going to have a snap judgment reaction to this. My dad didn’t laugh because he wasn’t taking me seriously. He laughed because he was trying to make me feel better. To better understand our family, you should probably know that I laughed when the doctor said “cancer” too. For this exact same reason. I just didn’t buy it. But even with that said, my dad insisted on going with me to see the surgeon. When I went to the imaging lab Monday night, the technicians there told me my General Practitioner had already picked up the images. 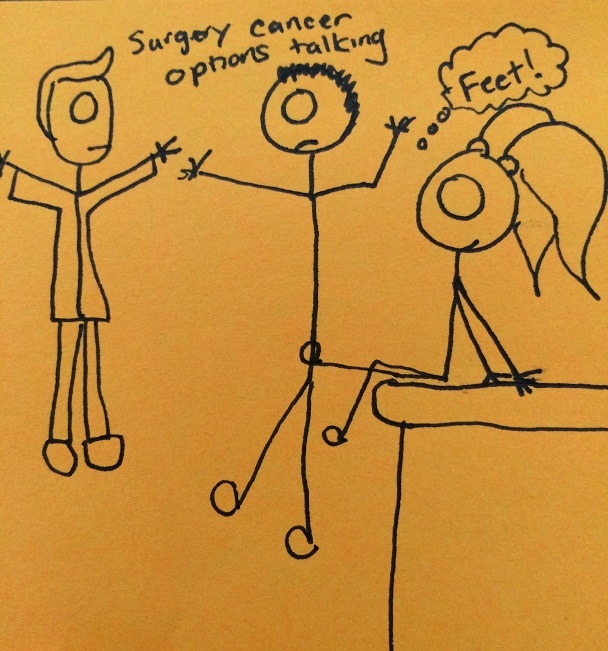 She’d picked them up and gone to meet with the surgeon personally. So the surgeon already had the images, and wasn’t that great? I didn’t have to worry about it. Only, that scared me a lot more than if I’d picked up the images myself. Doctors are busy people. Why would she take time out of her schedule to pick up lab work for me, and talk personally to the surgeon I was going to see? I found out when we got to the surgeon’s office on Tuesday morning. The surgeon I saw – let’s call him Dr. SeriousFace – had the same frozen expression on his face that my General Practitioner wore the week before. He dove right into examining me, asking questions about symptoms I’d never linked together before. He poked, prodded and examined, and seemed terribly interested in the upper part of my breastbone. When he poked there, it felt weird. 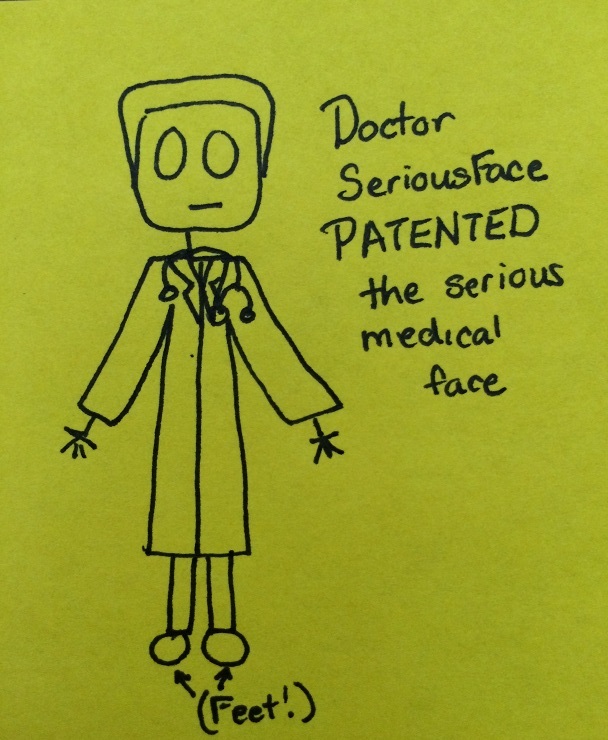 Meet Dr. SeriousFace. I did not think he liked me at all. People don’t poke other people in the breastbone all that much. He took Dad and I into another room, a little closet of a room with a few computer monitors and my imaging lab work pulled up on them. He showed us what my insides looked like at the moment. My dad sat down. I’d never seen my dad sit down when someone told him something. This view is what my chest looked like if you could view it from my shoulders down. I felt like I was watching things happen on a TV. I wanted to comfort my dad, but he was talking with the surgeon about biopsy options. A needle biopsy, or a surgical biopsy? What was the best choice? What would the doctor choose for his own daughter? I didn’t care. I would just do whatever the doctor said was best, because Dr. SeriousFace clearly knew his business. His face was so serious. It conveyed a lot of confidence. It could be a few different things. Dr. SeriousFace told us. It could be a thymoma, or some form of lymphoma. We wouldn’t know until the biopsy was complete and the results could be analyzed. It’s a funny thing, when someone tells you tough news. If someone you really trust is there, listening with you, your brain sometimes just doesn’t really process technical decisions. We picked a needle biopsy. *** It was the least invasive. 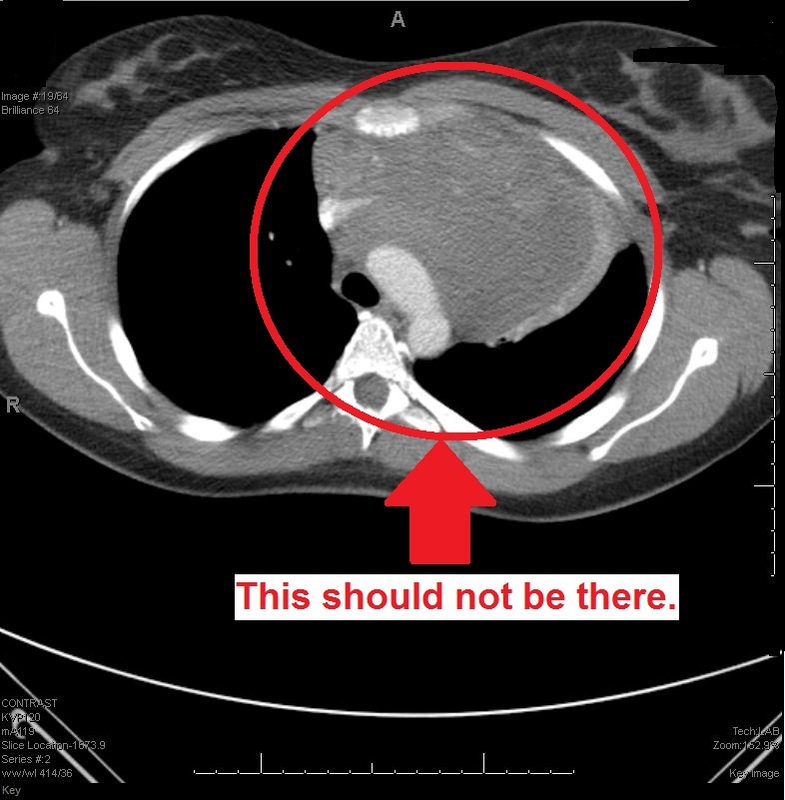 It would leave me less scarred, and it wasn’t exactly like they could miss the giant thing growing in my chest. ***I did have input. But since either way, I was going to have a biopsy, which kind didn’t seem so important at the time. I have no idea how to draw cars. We laughed. That part was nice. I would have my biopsy the next week. *We will not mention the fact that I probably learned this from a movie, and not from history or real research of any kind. But anyway, now it’s on the Internet, so it’s DEFINITELY TRUE. **I slept until 11 and then went to a diner to eat pancakes until I couldn’t move. Lets pretend I did that so I could try out posting in the evening hours. ******And added a lot of sugar and probably a unicorn. Oh, you don’t believe me? My mother and I passed notes all through our diner brunch. Point 2: Yes, I am a grown woman. Point 3: You’re welcome for the product placement, Belk and Ulta. I accept monetary rewards and also tiaras. And wait! There’s MORE! See that little arrow up there? It means we also wrote ALL OVER THE BACK OF THE PAGE. 1) I have spent a lot of this vacation playing murdery video games with my Dad. 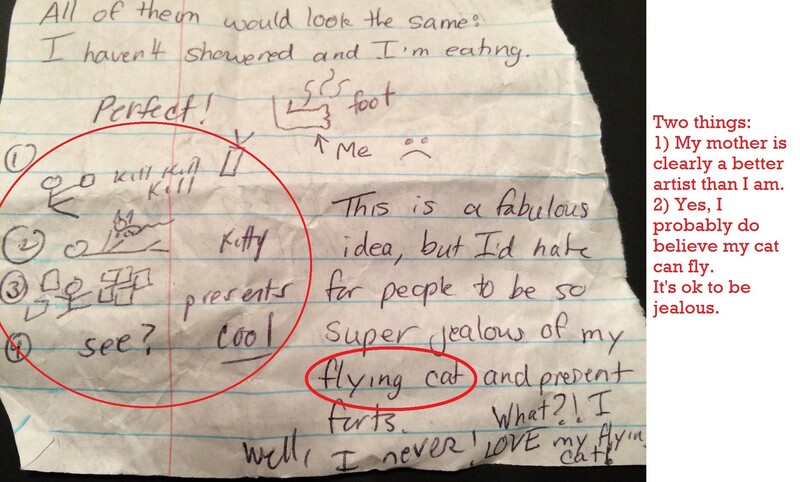 2) I have also spent a lot of this vacation cuddling my cat, but I think it’s cooler if she can fly. And she probably can. She’s cool like that. 3) I TOLD you I had a present fort. 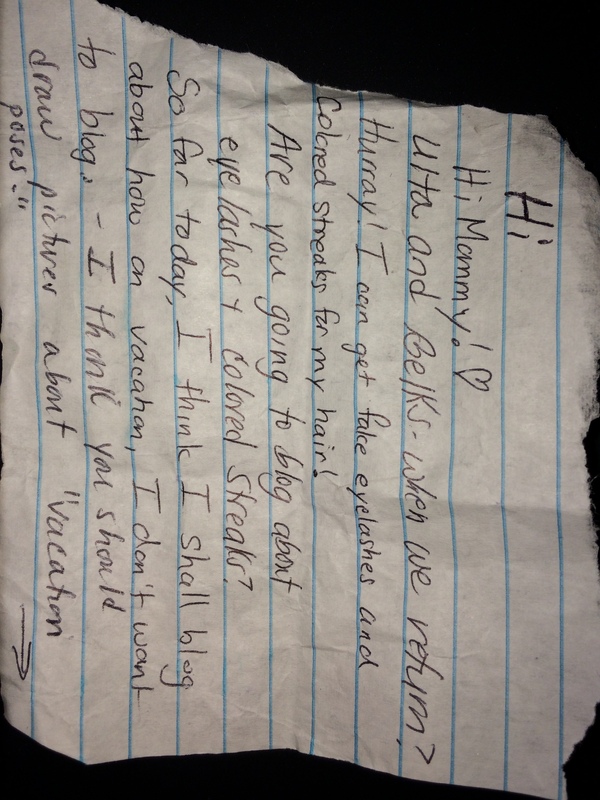 *******Ignored us completely, which only encouraged our note passing. So, basically, if anyone was wondering why I am the way I am: Here is your explanation. You are welcome. I’m happy to help solve the mysteries of the Internet. Also, I refuse to blog like a normal responsible grown up until after the New Year. Because it would interfere with my irresponsible nap time. But tomorrow I’m probably going to gossip about the South. So you should probably not give up on my blog just yet. Or, you know, hanging out with family and sharing love and joy and all. Whatever floats your boat. Happy Holidays, Internet. It’s not even a selfie. It’s just a really dumb-looking picture of me JUST FOR YOU. 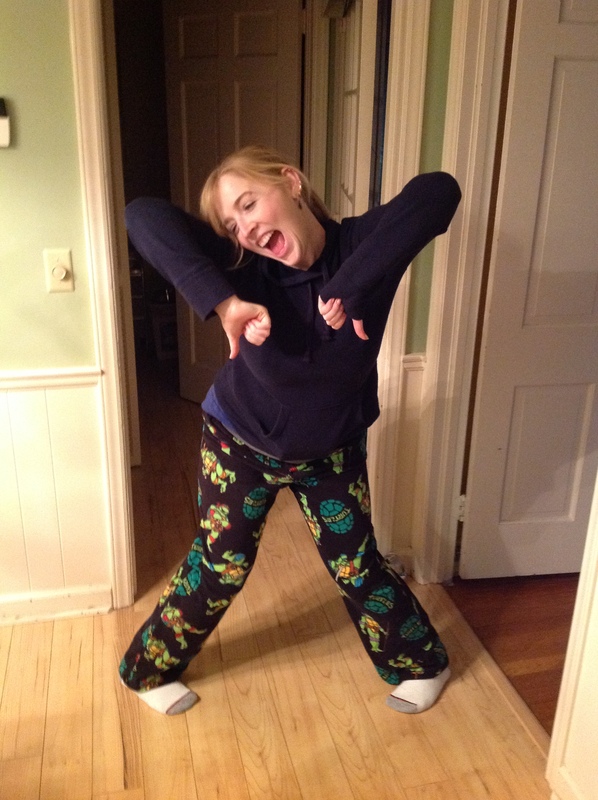 And yes, those are Teenage Mutant Ninja Turtle Jammies. Because my family loves me. Now go away and love your family. Even if you don’t celebrate Christmas, today is a super good day for hugs and morning booze. Merry Christmas, y’all. I’ll be in the present fort. This is my present fort. Go away. *What, do you not name your Christmas tree? Sparkle Motion, Phase 1. Ignore the plastic base. This tree is totally real. I swear**. For my whole life, my grandmother has maintained a tradition of giving every family member a hand-selected ornament. 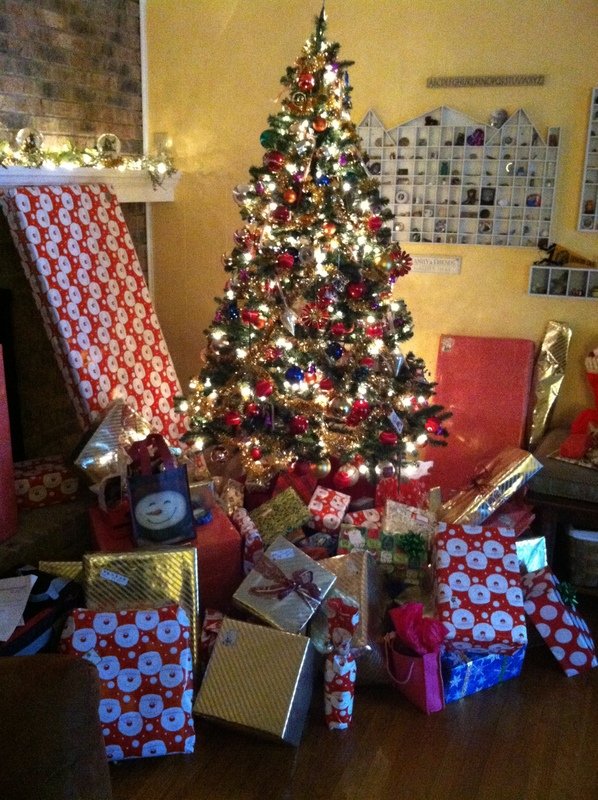 As a child, this was an eye-rolling pain – why get an ornament when wrapping paper should always contain a valuable toy? As an adult, I’m almost painfully grateful for this tradition. For one thing, I actually have a collection of ornaments to put on a tree. For another thing, most of those ornaments are so wildly unique that my Christmas tree is like no other. Despite that glorious tradition, this is the first year in a very long time that I’ve had my own Christmas tree. Generally, I just sort of hurl lights all around my living space, call it festive, and eat cookies until Santa comes. *** This is a remarkably delightful life plan, but this year, I decided it was time to step up my game. ***Life Lesson 307: Always leave cookies for Santa. A story for another day. So I rescued a box of ornaments from my parents’ house. 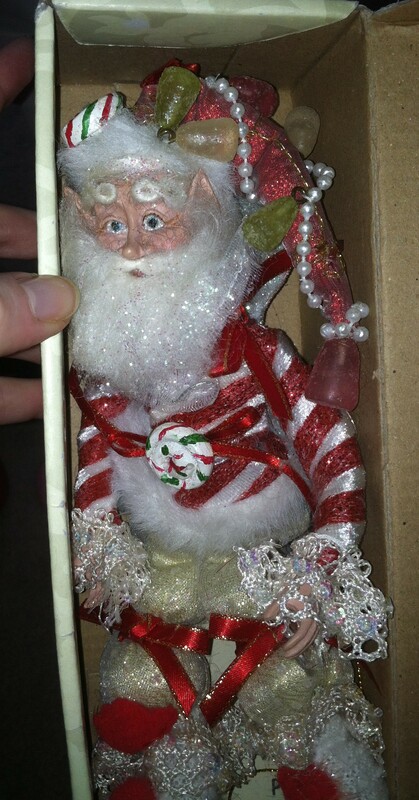 A box that I was told was filled with ornaments that were mine. Only to discover that this was not quite true. Yes, many of the ornaments were mine. But many of them were also my mother’s. Ever since my parents decided that fake trees were much easier**** than real trees, there’s been some fierce competition for space on their tree. This has led to some excess ornaments which sometimes are left neglected in the box. 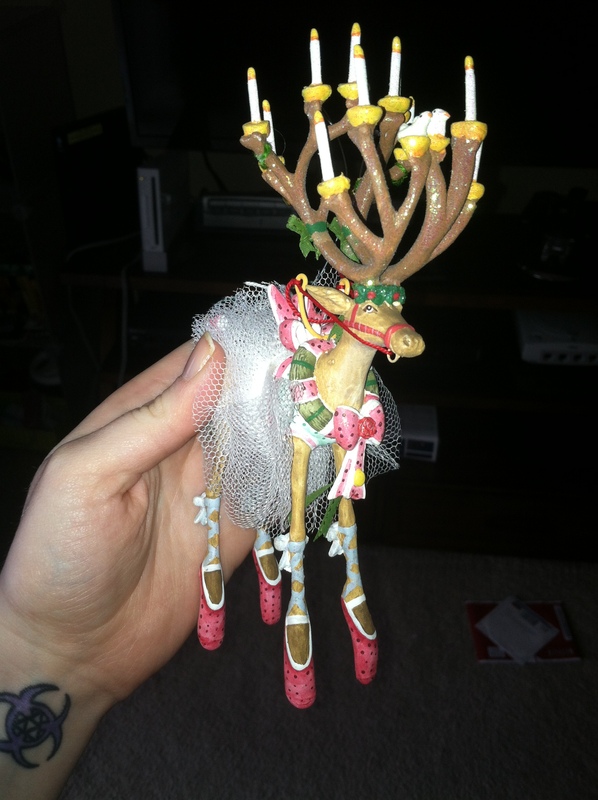 My mother has apparently solved this problem by giving me some of the more unique***** ornaments. ****Not full of spider eggs. *****Ornaments I have hidden at random around her house, with malicious intent. The mystical BalletReindeerLabra is a magical being****** that can bestow both candlelight and sugarplum fairy replacement on your holiday. She was gifted to my parents, but has perpetually been too heavy to live on the tree. Her strangely varied skills provoked endless smarmy storytelling from me over the years, which apparently makes her mine. Because my benevolent mother would hate to leave me uninspired, I’m sure. Thanks Mom. ******And actually a super expensive designer ornament, apparently. The Christmas Mermaid combines both the fun of The Little Mermaid with the elaborate hair styling of Cinderella’s stepsisters. In your face, Disney. Meet the Christmas Mermaid, a staple for Christmas trees on shipwrecks. She’s festive AND practical. Also, she’s blue because water is cold in December. Duh. She now lives on the toasty warm tree, pining for her frozen watery home*******. She’s my festive hostage, courtesy of my mother informing me that this was obviously my decoration, despite my memories to the contrary. Thanks, Mom. 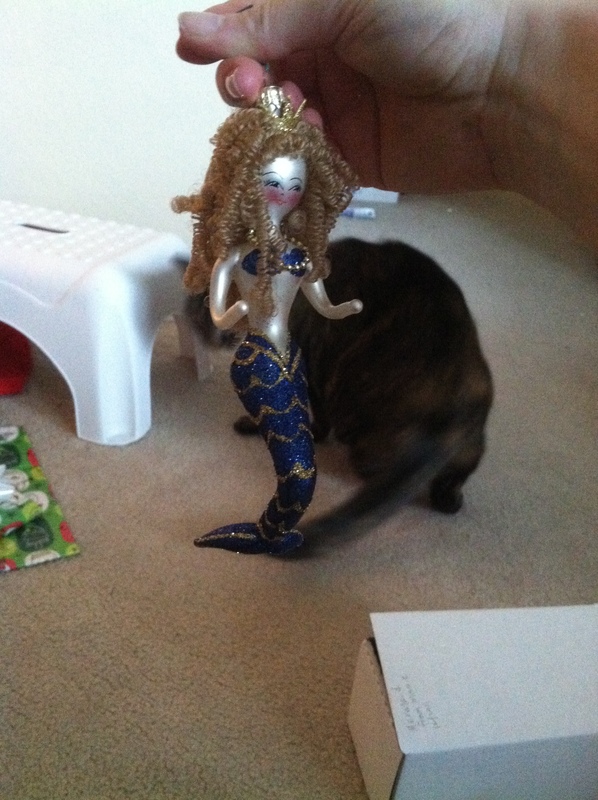 *******To make her feel more comfortable, I put her next to my shark ornament. Do you not have a shark ornament? Oh, well, your grandmother must not be as cool as mine. Bummer. And now we come to the greatest of them all. Meet Santa fairy. He’s factually a fairy. He has wings. I swear. And delicate leggings. And pointy shoes. ********I like to have really illogical fears. Besides, Lookit those eyebrows. Just LOOK at them. He was in my ornament box. Because, you know, mothers want their kids to overcome their fears. Thanks, Mom. 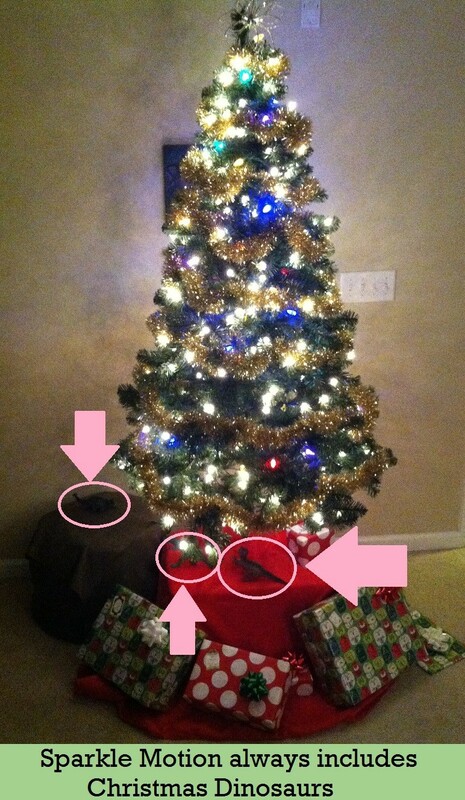 What, do you not have Christmas dinosaurs? It’s like you don’t even celebrate the holidays. All these ornaments********* (and so many more) have found a home on my tree, It’s the most unique tree in the world. I love it. Sometimes I am slightly scared of it, but the different ornaments are all memories, and I wouldn’t trade them for the world. Also, my tree has a fuzzy lion and a glittery flamingo. Does YOURS? *********Except Santa Fairy. He is going RIGHT BACK where he came from. Yeah. I didn’t think so. You’re going to have to step up your game, or I’m going to start questioning YOUR commitment to Sparkle Motion.